MBM Corporation produces world-class Destroyit paper shredders and state-of-the-art finishing equipment for the graphics and printing industries. MBM Corporation’s parent company, IDEAL Krug & Priester of Germany, is the leading manufacturer of paper shredders and small format paper cutters in the world. At MBM, innovative thinking and exhaustive research and development go into every product we sell. Our products are sold through an extensive dealer network throughout the United States and backed by a staff of knowledgeable service representatives and one of the best warranty packages in the business. 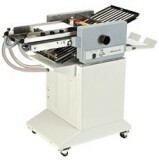 Uses high-capacity, 5,000-staple cartridges for more continuous throughput. Automatically stops and signals when staple cartridge is empty. This floor model booklet maker can produce up to 100 page booklets.